Warm weather is finally on the way, guys! The forecast for next week says 70's to 80's and I'm living for the moment I can slip on some shorts and tee and be on my way. But you know what my favorite thing about the warm weather is? All the fun, colorful trends it brings, of course. This year I've been spying pom poms everywhere and I'm not sure if it's the cheerleader in me or what, but I'm obsessed! Today, I've partnered up with Ashley Stewart to show you two fun ways (one for the day and one for night!) to add pom poms and color into your spring/summer wardrobes! Ashley Stewart is the plus size fashion brand with 89 stores spread out all over the US (as well as an online store) that offers a huge selection of clothes, accessories and more with sizes up to 32. They also cater to women who need wide calf sizes as well as wide width. Right now, Ashley Stewart is offering 40% off all full price styles with the code PRIMP40 so head on over and treat yourself! Not your size? 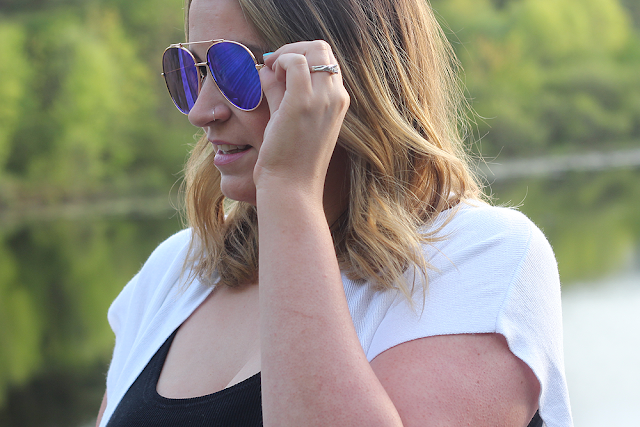 Ashley Stewart has the cutest accessories (their sunglasses are too cute!)! * Make sure to click here use code PRIMP40 for 40% off all full price styles! This outfit is just the right amount of comfy and cute! You can never go wrong with a basic ribbed tank top paired with some ripped jeans. I cuffed them at the ends to show off the grommets on these super cute wedges. This long white vest has pockets (yesss!) and added a little somethin' somethin' to the outfit. 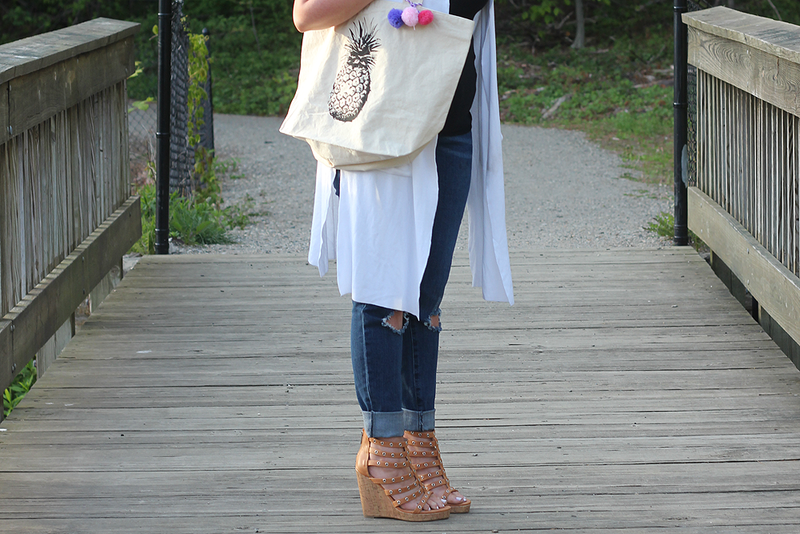 Let's talk about this humungo tote bag, shall we? The pineapple and pom poms totally caught my eye. 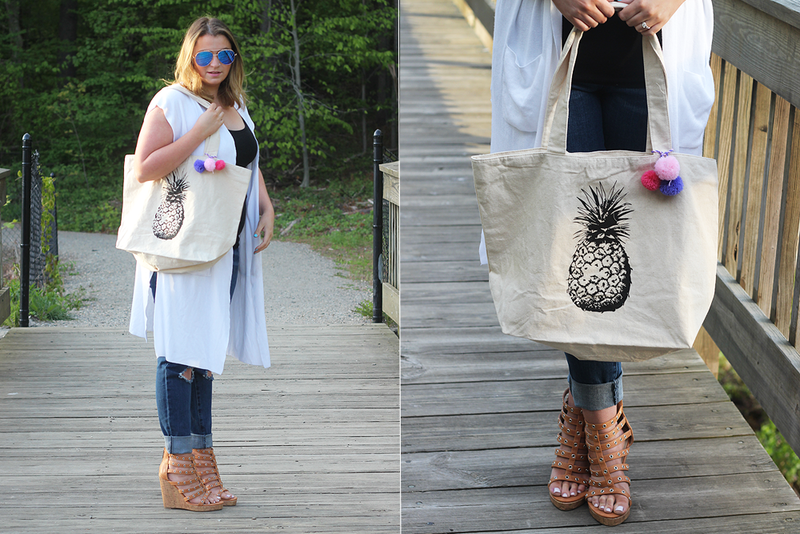 This is the perfect beach bag as you can fit a whole bunch in it! * Make sure to click here use code PRIMP40 for 40% off full price styles! Oh gosh, guys. I never show this much but this outfit was so much fun to rock. You can't really see it but the romper actually has long bell sleeves. It was a little risque with the long cut criss-cross top but I loved the chicness of the shorts length (not too short, not too long!) and the belt tie. The denim jacket is probably one of the coolest jackets I've ever owned! It has the coolest details with the pineapple patch on the back, the ripped elbows - so cool! I'll admit I was nervous walking around in the pom pom wrap heels but they were surprisingly comfy! Lastly, how cute is this white pineapple bag? It's subtle enough that the outfit isn't screaming pineapple at everyone. Too cute! Which outfit would you rock? * Click here use code PRIMP40 for 40% off full price styles! YAAAAS you and that romper with the jacket is 100% fabulous! LOVE IT! You look great girl. You and I have similar taste in clothes. ;) I love that Pineapple jacket on you... I had admired it and was gonna grab it but passed.